"A Reason for Living" is Laurent Grenier's extremely moving story of his triumph over a disabling injury as he found meaning in life despite everything. Part autobiography, part philosophical essay, "A Reason for Living" looks back on the author's past - his active, athletic youth abruptly interrupted by his diving accident, which left him a near quadriplegic and led to further hardships - and shows us the way to fulfillment against great odds through the courageous pursuit of wisdom and happiness. "My diving accident was a misfortune that deprived me extensively of my life's meaning. It was also a chance to discover a deeper and truer reason for living. Why live? See what my answer is. I trust it will help you live a more meaningful and fulfilling life." L. G.
FURTHER INTRO TO THE BOOK: Hardship often serves as the catalyst that promotes existential questioning and turns many a soul into a philosophical one. Who are indeed likely to ponder on the meaning of life but those who are at a loss to conceive of this meaning, owing to their daily struggle with suffering while they yearn after joy? Some may search for enlightenment and serenity in the church and discover a doctrine of love and salvation that arouses in them a sense of having found their true home after a period of painful wandering. Others - rationalists by nature - may walk skeptically and wistfully past the square that leads to this place of worship. They are lonesome seekers of wisdom and happiness as the riddle of life boggles their minds and torments their hearts. "A Reason for Living" was written for them, in an effort to help them view life in a most positive, meaningful way. It complements rather than opposes the Christian viewpoint, though it does call certain aspects of it into question. The purpose of the book is largely therapeutic, not merely polemical. It proceeds from a dogged determination to provide a legitimate and salutary answer to the ever so pressing question "Why live?" It is about helping people lead wiser and happier lives - especially educated and inquiring people who not only are hungry for such an improvement, but also are committed to going to great lengths to satisfy this hunger. 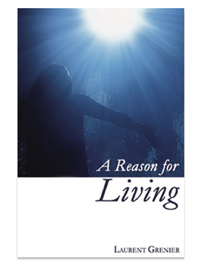 Furthermore - and this adds to the unique and resolute positiveness of the book - "A Reason for Living" is both philosophical and autobiographical, and does more than deliver a message; it sets an example. It is a worldview and a life story, the latter serving as a backdrop for the former in a very illustrative, relevant, and convincing way. The author - now 47, a once teenage athlete who became severely disabled due to a sports injury and slowly rebuilt his life from the ground up by dint of considerable efforts (including much study and reflection) - thinks what he says and lives it. His words are all the more credible and inspiring as they are matched by his actions. REVIEWS: 1. "First of all, your writing is very strong - stylistically, grammatically, and in terms of content.... The depth and breadth of your knowledge in philosophical and scientific matters are extremely impressive." Eric Barstad, author of the book "A Gloss on Our Painted Gods," and graphics designer/editor at Shadow Box Creative Media ltd.
2. "I'm really impressed.... Your writing is very in-depth and scholarly. It brings out your work.... You did a fantastic job!" Lisa D'Angelo at BookReviewNU. 3. "When reading your book, I am filled with a desire to learn more and to acquire the deep compassion and philosophical meaning that you bring out so brilliantly." Lori Perkins, customer service representative at FIDLAR-DOUBLEDAY Inc. and freelance editor.